The HK Acroni Jesenice was a Slovenian ice hockey team from Jesenice, who took part in the Austrian Erste Bank Hockey League and the Slovenian Hockey League until 2012. In summer 2012, the club hired the operation of gambling due to ongoing financial problems. The HD mladi Jesenice Farm-/Jugendteam remains, however, and has been increasing since 2012 part of the newly founded Erste Bank Young Stars League. The club was founded in 1948 and is 8 times Slovenian champion and record holder with 23 tracks of the former Yugoslav league. The dominance of the association took its beginning in 1957 when the team for the first time won the Yugoslav Championship. In the next fifteen years, the steel city dwellers remained unbeaten. Only in 1972 there was the arch-rival HDD Olimpija Ljubljana again another masterpiece. This dominance was not until just before the breakup of Yugoslavia broken by the Croatian club KHL Medveščak Zagreb, who won the last three state titles. In the Slovenian League, the HK Jesenice had indeed beaten by number of championships the HDD Olimpija Ljubljana, but the two teams remained together the defining moment of the league. In the international competition of the Alps League HK Jesenice Although a title win was denied, in the subsequent Inter League but it brought the team to three championships. In April 2006, the club applied for participation in the Erste Bank Hockey League from season 2006/07. The final decision was taken by the Conference of Presidents on 7 July 2006. The conditions on participation but were already clarified beforehand mostly. So Jesenice has deposited the required bank guarantees, accepted the implementing rules of the league and the associations of Slovenia and Austria agreed to the change. The main motive for the change in the EBEL is - measured by the HK Jesenice - relatively weak Slovenian league in which you could master six and nine runner-up title win since its inception. After changing to the new league the team missed in their first season barely participating in the playoffs. Only in the last game of the fundamental passage, the Vienna Capitals secured with an away victory in Jesenice in overtime the fourth playoff spot. The following year, the team reached after the regular season in fourth place, slipped in the placement round but finished sixth from. In the quarterfinals, followed with a 2:3 defeat in the best- of-five series against the EHC Linz early Saisonaus. In the 2008 /09 season Jesenice resulted in the first third of the base transit over long distances the table. The team that started the season with only three Legionnaires, but fought constantly with a problem on the goalkeeper position and finished the regular season in sixth place. Just before the start of the playoffs, the Canadian goalkeeper Matthew Yeats had already been committed. This, however, was injured during the quarter-finals, prompting the team to eventual runner- EC Red Bull Salzburg was eliminated. In the season 2009/10, it was announced that Jesenice had to contend with massive financial problems. As already two years earlier the brothers Marcel and David Rodman switched to the Vienna Capitals. Also left defender Ales Kranjc the team. While some new players were signed, but the association's board let it be known to especially want to contest the season with promising young players. This project has been transposed into action. 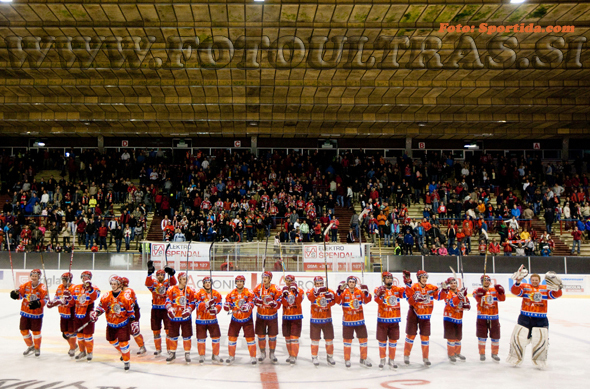 Although Jesenice spent most of the season in last place, but found the end of the basic passage into the game and was able to achieve some unexpected victories. Not least because of this increase overtook Jesenice just before end of the season, the financially strapped local rivals from Ljubljana and could decide the season second to last place. How far the season of budgetary consolidation was appropriate is not yet in sight. This club policy was continued in the season 2010/11. Despite a good start to the HK Jesenice, however, was passed in the table to the back and decided to EBEL season on the last rank. Following, however, succeeded in the total ninth win of the Slovenian league title, which was the fourth title in a series at the same time. The season 2011/12 became a disaster for the club, than the financial problems were more pressing. Even before the start of the season left a number of new players committed to the club, which was also repeated in the course of the season with their successors. Jesenice had no chance at the last place of EBEL table and had to back up towards the end of the season also difficulties to-day operation. As a result, the team also the competitors HDD Olimpija Ljubljana defeated in the battle for the Slovenian championship. In the spring a long time in participating in the newly founded Inter- National -League was worked, but ultimately proved to be unfeasible. So the game operation after 64 years was set. As the main and title sponsor stepped over decades on the steelworks Acroni Jesenice. The close connection between the steel industry and the hockey association was also evident in the name of the fan club Red Steelers. The HK Jesenice also characterized by an excellent young talent. Over the years the club has produced a large part of the Slovenian national team, and many of the educated in Jesenice players found their way into some of the top European leagues. Home of HK Jesenice was built in 1978 Dvorana Podmežakla that offers approximately 5,900 spectators since the addition was built in 2010 east stand. The now somewhat dilapidated building is to be refurbished by 2013. During the refurbishment, the audience capacity is expected to sink back to about 4000-4500, as the standing room to be replaced by seats. The registered fan club of HK Jesenice were the Red Steelers. They were known by hockey fans for the impressive backdrop which they managed with the loud "Je - se -ni - ce ," Call - not only in their own hall. Their name derives from the existing decades sponsor connection to their teams with the steelworks of Jesenice, Acroni fro.